We transformed our patient Christie. Literally. Before and after photos. We did veneers on her 4 front teeth. For Christie, our work literally changed her life. She was able to go out with her friends and smile again. She could smile without holding her hand over her mouth. In her own words, she felt twenty years younger. 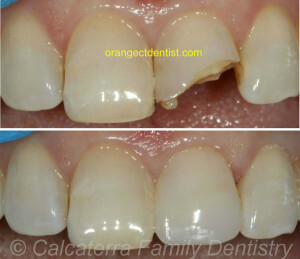 We will often do a “mock up” in wax of what the teeth will look like. This lets you envision your new smile! Porcelain veneers are a delicate cosmetic dental procedure. Prior to starting, we discuss with you at length your goals and objectives. 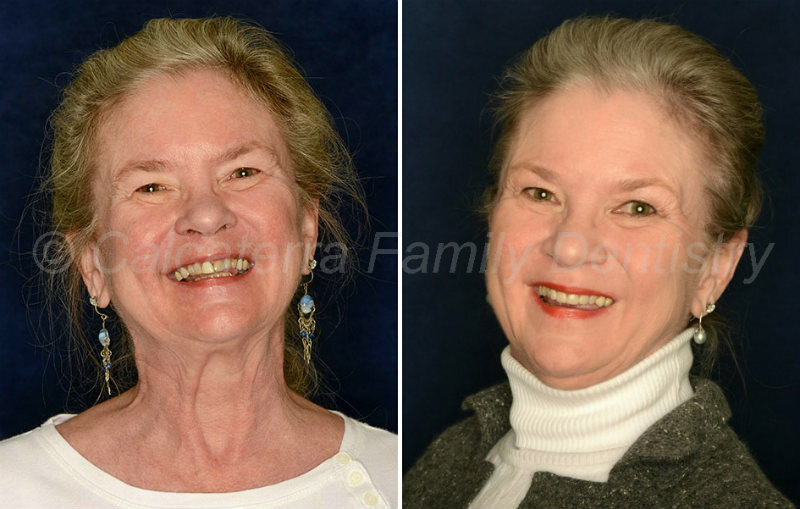 We review photos and often times make models of what you want your smile to look like. See the photo to the right. Once you are happy with what we can achieve, we can begin! After administering local anesthesia, we remove a very thin amount of the outermost layer of the front teeth – usually less than 1/20th of an inch. We then make a special mold of your front teeth so that our laboratory can custom make the veneers. We then make temporary veneers for you to wear – these are a preview of what they will look like. We will often times take over 20 photographs throughout the process so that we can make the veneers exactly to your expectations. You return three weeks later and we try in the definitive veneers. We verify the fit, the shade, the shape and many other variables. We listen to your feedback to make sure they are to your liking. We then use a powerful cement to bond them in. You then leave a changed person! This broken tooth was fixed in one hour with bonding. Bonding can be done in one visit while veneers take a minimum of two. Because porcelain veneers require more time and involve a custom lab, veneers are significantly more expensive. Due to the nature of porcelain, we are able to incorporate special features (small white spots, translucent areas, etc.) that are next to impossible to achieve with bonding. Veneers are less likely to chip or break. In general, veneers will last longer than bonding. Some bonding is covered by traditional dental insurance. Veneers are never covered under any dental insurance plans. Each case is unique and all of our patients receive personalized attention. Contact us if you would like a consult for bonding and/or veneers.